If you are planning to spend time during these last summer weekends on Wisconsin’s northern-most state forest, be aware that the boat landing at the mouth of the Brule River is closed. High water levels and wave action of Lake Superior have eroded the road leading to the boat landing. This popular take-out point is still open for carry-in landings, but vehicles are not allowed to drive to the landing. The distance to carry a watercraft is about 100 yards. 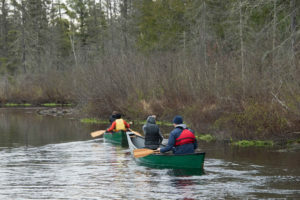 Paddling the Bois Brule River has long been a popular activity on the Brule Rule State Forest and is not impacted by this closure. Find more information about recreational opportunities on this and other northern state forests here. Chief State Forester Fred Souba, Jr. completed another significant step in the DNR Division of Forestry reorganization with the appointment of the leadership team. Earlier this year, Souba changed the administrative structure of the Division to help improve efficiencies and better align staff with the future of the Division’s strategic direction implementation. The 60 Wisconsin DNR personnel and six engines that helped on out-of-state wildland fires this summer created a win-win scenario for all involved. 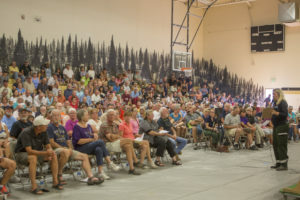 Public Information Officer Catherine Koele addresses a community group regarding a fire on the Lolo National Forest in Montana. Not only was the assistance of tremendous value on the 14 fires in six states and two Canadian provinces, but these assignments provided valuable training and experience for DNR employees in working together for extended periods of time under less-than-ideal conditions and in dealing with forest fire safety situations in large fire environments. The assignments provide employees an opportunity to obtain and maintain their forest firefighting qualifications and credentials. They also allow us to demonstrate and test our equipment and tactics in large fire situations not available in Wisconsin every year. This sharing of resources is crucial given that no single agency can afford to have all of the personnel and equipment necessary to fight forest fires during peak activity times. Wisconsin routinely uses air resources and personnel from other agencies for assistance during our spring forest fire season. The valuable training and experience gained by our staff greatly benefits the state of Wisconsin and its ability to respond to local forest fires and provides the requesting agency well-trained staff and equipment to help manage their wildland fire incidents. Truly a win-win scenario! It’s official. 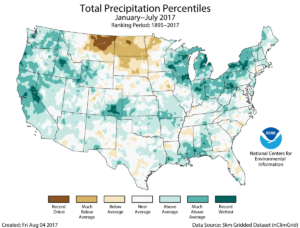 January through July 2017 was the wettest Wisconsin has experienced in the 123 years data has been collected. The average across the state was 25.25 inches, which is 7.14 inches above average according to the National Weather Service. Flood and other storm damage have occurred to forests and urban trees in many areas of Wisconsin. We suspect storm damage from May to July has led to a number of new oak wilt infestations in impacted areas. The wet weather has also led to abundant leaf and needle diseases such as anthracnose. Plentiful precipitation has similarly played a role in insect populations. 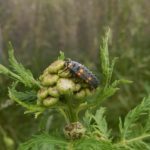 Japanese beetle larvae thrive with consistent soil moisture and the consistent rain in recent years has resulted in large populations of this pest across the Midwest. In contrast, the wet, humid spring led to another year of high mortality rates for gypsy moth caterpillars from disease. Written by Mike Hillstrom, forest health specialist, Fitchburg (Michael.Hillstrom@Wisconsin.gov), 608-513-7690. You may be noticing leaves of various hardwood trees already turning to fall color in lowland areas. These lowland areas are holding more water this year and it is affecting the trees. The trees in these areas are stressed from being in water too long, and this is causing the hardwoods leaves to turn color early. Some of the hardwoods are dying in these lowland areas, and most conifers in these areas are also dying due to too much water. What is causing hardwood species to appear off-color? Numerous issues are causing various hardwood species to become off-color this summer. Below I’ve listed a few issues that I’m seeing. 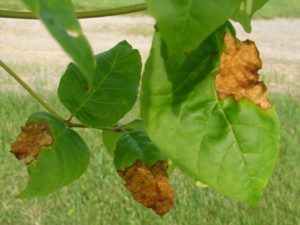 Most of these issues do not require any control or any mitigation if your trees are showing these symptoms. Anthracnose causes irregular dead areas on ash leaflets. 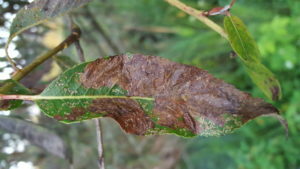 Anthracnose – irregular dead brown blotches on oak leaves and ash leaflets, caused by the fungal leaf disease anthracnose, is making some oaks and ash appear to be browning. Phone calls with concerns about dying trees have been coming in. Symptoms are typically worse in the lower crowns, and the ash I’ve seen with this issue in Marinette, Oconto, and Vilas Counties have very thin looking crowns. Browning areas on this aspen leaf are caused by aspen blotch miner. Aspen blotch miner – all ages of trembling aspen are being impacted by aspen blotch miner this year. Aspen crowns appear thin, leaves appear off-color from a distance, “blisters” form on the underside of the leaf, and eventually the leaves curl and brown of the leaves. This is the 4th year in a row that I’ve noticed defoliation by this insect. This year, similar to past years, I’ve seen it in Oconto, Marinette, Florence, Forest, Oneida, and Vilas Counties. Tiny larvae spend their entire life feeding within the leaf and pupate within the area that they mined out. Moths emerge in August and spend the winter in a protected place. The winding galleries of aspen leafminer make the tree appear grey from a distance. Aspen leaf miner – for those leaves that aren’t heavily infested with aspen blotchminer, they are often infested with aspen leaf miner. 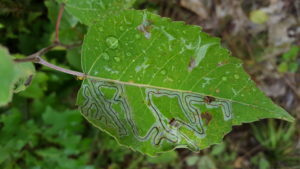 Aspen leafminer is another tiny larvae that spends its life feeding within the leaf, but they create picturesque winding trails that give the leaves a pale appearance. 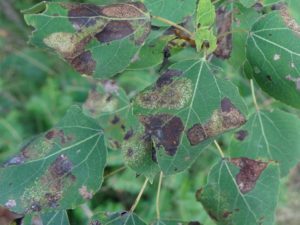 Balsam poplar browning – a couple of things are going on with the Balsam poplar in Brown and Oconto Counties, including a leaf disease and aspen blotch miner. The trees are thinnest in the lower crowns, but the upper portions don’t look too hot either. 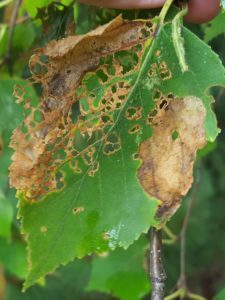 This birch leaf shows both the feeding of Japanese beetles (which don’t eat the veins of the leaf), and a brown blotch where birch leafminer was feeding. Birch dropping leaves – every year about this time birch will drop a portion of their leaves. Many of those leaves don’t appear to have much damage on them. But there is certainly leaf damage if you look closely at birch. The primary issue that I’ve been seeing this year in Brown, Oconto, Oneida, Shawano and Vilas Counties is from birch leafminer. Dead blotches on the leaves may make you think anthracnose, but holding the leaves up to the light you will discover you can see through them and see signs of insect activity inside the leaves. 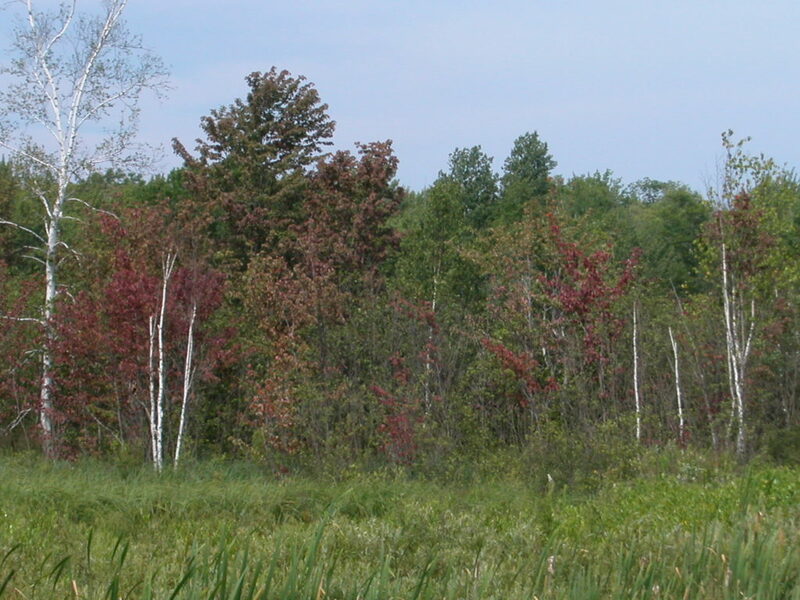 Birch look brown – defoliation from Japanese beetle in Minocqua/Woodruff area is causing the birch to appear tan. Defoliation is more significant in the lower canopy, but some trees are heavily defoliated top to bottom. Japanese beetle is something that you may want to do some treatments for. There are many options for treatments, whether excluding them with netting, or using insecticides against the adults, using traps for the adults, or using insecticides or fungal biocontrol against the larvae. UW Extension has a great document with more info on Japanese beetle control. A young black cherry turns red. While some are being defoliated by lacebugs (causing them to turn red), others like this one have very little defoliation. Cherry lacewing and cherry turning red – I’m not quite sure what’s going on with all of the cherry. Some of them are turning reddish in color because they are being defoliated by Cherry Lacebug (Oconto County), but others don’t seem to have any damage that I see (Marinette and Oconto Counties), so I’m not sure why they’re turning red. 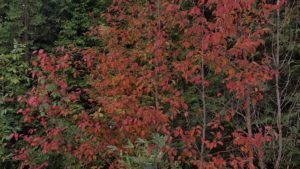 Maple early fall color – check out Todd Lanigan’s article which highlights the high water levels that are causing stress to lowland trees. Many maples growing in these lowlands are already turning a rich shade of red due to water stress. Brown blotches on these oak leaves are not anthracnose. The tiny oak leafminer lives within the leaf, feeding on the leaf material. The damaged area eventually turns brown. Oak leafminer – in Minocqua/Woodruff area I was noticing some oaks were looking a bit brown, which I assumed was probably anthracnose. Always good to double check these things! Once I stopped to check it out I discovered activity from oak leafminer was to blame, causing dead brown areas where the insects feed within the leaf. 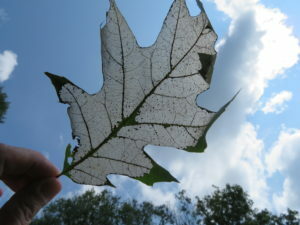 Defoliation by oak skeletonizer will leave a layer of cells, which appear like parchment paper if you hold the leaf up to the light. Oak skeletonizer – scattered light levels of defoliation have been seen in nearly every county in Northeast and East Central Wisconsin. Oak skeletonizer defoliates oak leaves by scraping off a single layer of the leaf, leaving a parchment-like layer on the leaf which turns pale tan. Holding these leaves up to the light makes it clear that they’re defoliated. A willow leaf is brown where willow flea weevil larvae have been feeding inside the leaves. Willow browning – although we started this spring with some willow scab that caused significant defoliation, the current issue is the leafmining action of the larvae of willow flea weevil. This is the fourth consecutive year that Brown, Calumet, Marinette, Shawano, and Oconto Counties have experienced significant defoliation of willow from this insect. I’ve also noted this in a few willow in Florence and Langlade Counties this year. Written by: Linda Williams, forest health specialist, Woodruff, (Linda.Williams@wisconsin.gov), 715-356-5211 x232. Ladybug adults and larvae are great predators of aphids and scales and help keep those pests in check. Ladybug larvae don’t look much like ladybugs though, so you may not notice them, or you may wonder what the tiny monster is that’s munching on aphids. Ladybug larvae come in a variety of colors and shapes. Several people have described them as looking like a small dragon, or for those of you from Rhinelander, perhaps they look like a tiny Hodag. 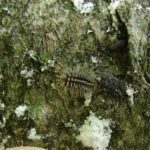 I recently came across a critter that I would have never guessed was a ladybug larvae; it looked more like a mealybug to me. 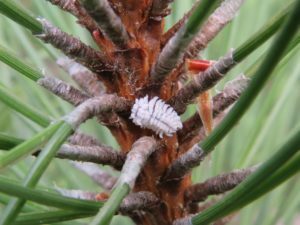 It was on red pine, and there were no aphids on the red pine, so nothing triggered me to think “ladybug larvae.” After snapping a few pics, I dismissed it as an oddity. But of course oddities are just mysteries waiting to be solved. Mike Hillstrom, my counterpart in Fitchburg, helped narrow this down to a ladybug larvae. Ladybugs in the Hyperaspis genus have larvae that look like mealybugs, and those ladybugs (both larvae and adults) specialize in feeding on pine tortoise scale! How fitting since I found it on red pine! 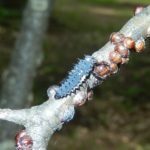 The following photos illustrate that ladybug larvae come in many shapes, sizes, and colors. This ladybug larvae, in the genus Hyperaspis, looks like a mealybug and specializes in feeding on pine tortoise scale. Fall webworm started showing up around the middle of July. This is a native insect that feeds on deciduous trees and shrubs, and it is makes an appearance every year in yards and forests. 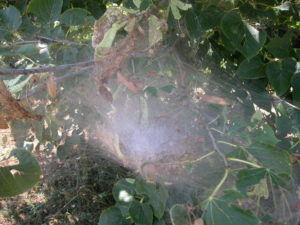 Fall webworm forms loose webbing over branch tips and if it is a small tree, the entire tree can be completely webbed. Inside the webbing you’ll find caterpillars (alive and dead), partially eaten leaves and frass (caterpillar poop). 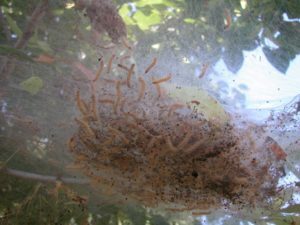 Fall webworm is more of a cosmetic problem than a tree health problem, but if you want to control them, the easiest way to do that is to open up the webbing. You can take a rake, fishing pole, long stick, or whatever and open up the webbing. This will allow predators to get at the caterpillars inside the webbing. Or you can use the rake, fishing pole, etc. and roll the webbing up. Then peel the rolled webbing off and place the entire web in a container of soapy water for a couple of days. If you want to use an insecticide, you need to make sure the insecticide is labelled for caterpillars/fall webworm and the spray needs to penetrate inside the webbing. With all pesticides, the user needs to read and follow label directions. There is no need to prune off the branch. If the tree is healthy, the defoliation should not harm the tree. You can find more information on fall webworm here. Much of Wisconsin has reached peak emergence of emerald ash borer adults. 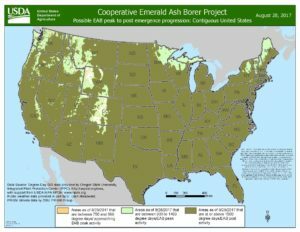 EAB emergence map as of August 28, 2017. In the north the light green shows peak emergence, and olive is past peak emergence. EAB continues to be found in new areas. Wisconsin tracks EAB at the municipality or township level. Quarantine counties are shown in tan and infested areas are shown in green on the map below. EAB quarantine map. Counties shaded in tan are quarantined for EAB, green areas are townships and municipalities where EAB has actually been identified. A number of new oak wilt infections have been identified in Vilas County this summer. I’m waiting on results for a few more samples, and have several more trees to go and collect samples from, so there will probably be additional reports to come. Cloverland Township, Vilas County, had its first oak wilt identified this year. Unfortunately, oak wilt was first introduced to this site last year when the harvest extended into the high risk period, and the storm damage that we had in May allowed oak wilt to infect many new trees at the site this spring. In Arbor Vitae Township, northeast of Woodruff, there are a number of new sites where oak wilt has been identified; some of these are right on the southern border of Boulder Junction Township. And several wilting trees have been identified along Nabish Lake Rd in Boulder Junction and Plum Lake Townships. As I said, I’m still waiting on a few more results, as well as needing to collect from a few trees that were recently reported to me. Oak wilt is generally not common in the northwoods so if you see wilting oaks in July or August, please report them. 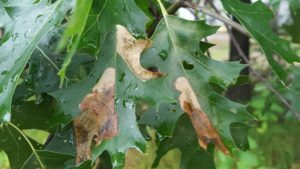 To minimize new infections of oak wilt it’s important not to prune, wound, or harvest during the high risk period in the spring, April 15 – July 15 in the north. For more information about minimizing the risk of overland spread of oak wilt, or for info on controlling oak wilt infections that are already present, check out the Wisconsin DNR oak wilt page.